#mfxbroker SCAM! NOT PAYING !!! Hello everyone I am a citizen of the capital Tbilisi, I am an investor MFX BROKER GEORGIA in the company of the amount invested, to yield offered me my money from the profits of any benefit to me and now, and now is at the foot of my own money to everyone not to trust anyone in this MFX BROKER IGOR VOLKOV AND MARGO ZHIZNEVSKAYA These are the criminals do not trust these people and this company plzz!!!! #mfxbroker SCAM! NOT PAYING !!! They never serve the withdrawal request. I can only hope and pray, that they will receive appropriate punishment. Igor Volkov, the bandit is the one who should be responsible for this criminal acts in this life and in HELL ! Since 15 August ’16 until now 19 September ’16 they only give their reason that because of technical problem. I have bad thinking that MFX Broker is bankcrupt, but they still doing offer their deceptive promises. 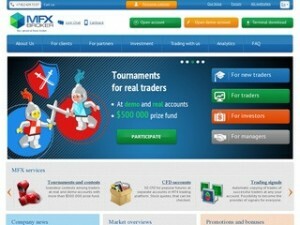 This is my firts forex broker. For now i’m interested in small sums but at high leverage and i’m quite satisfied. They have intuitive trading platform and many types of accounts. I have trade with MFX for 10 months and (before i traded with FXCM) i haven’t had any problems with Masterforex. Spreads are low and they have intuitive trading platform (mobile platform also OK). Plus they offer good conditions of trading. I’m from Finland and has opened account at MFX few months ago, until now I have quite positive experience working with them. They are pretty good in every aspect. Their do job quite well and I see no reason to write allegations against them. I will recommend this broker cause: very nice and skilled clients department, good conditions of trading, no problems with output! Broker is ok. I have standard account. Spreads execution: 99% positions is ok so better than my last. Hi. Im newbie with binary options trading, but im want to start, and my question is – yours platform will be ok for me, for begginer? Saya terjun di dunia forex sudah 4 tahun lamanya. Mencoba beberapa broker dengan mendaftar akun demo atau sekedar ikut kontes untuk mencoba kinerja flatform mt4 atau layanan yang diberikan. Begitu menemukan kualitas broker yang bagus, pelayanan yang ramah dan deposit/withdrawal dengan cepat. Biasanya saya langsung berinventasi dengan akun rill tanpa ragu bila menemukan sesuai dengan kriteria saya. Selama saya berkecimpung di forex ada beberapa broker yang hanya mengambil keuntungan tanpa memperhatikan kelangsungan hidupnya. Tidak berdasarkan pengalaman saya saja, beberapa rekan-rekan saya mensurvei salah satu broker ini (MFX broker namanya). Mereka mengikuti kontes atau inventasi rill. Dan dari beberapa yang mengikuti kontes demo/rill menemukan kejanggalan. Ada beberapa yang memenangkan turnamen. Mereka mendapatkan hadiah sesuai posisi dan langsung bertransaksi dengan harapan investasinya berkembang. Setelah nominal tertentu withdrawal akan dilakukan dan tidak sesuai kenyataan akun mereka telah dihapus tanpa adanya konfirmasi. Oleh karena itu saya tidak merekomendasikan untuk rekan-rekan yang baru ingin mencoba broker tersebut untuk berinventasi langsung. Anda bisa kehilangan uang dan waktu anda percuma. nominalnya tidak seberapa, tetapi yang dipertanyakan adalah kinerja broker ini bisa dipercaya atau nggak? Itu terserah anda yang menilai. I jump in the world of forex already 4 years old. Try some brokers with a demo account or simply register for the contest to try flatform mt4 performance or services rendered. So finding a good broker quality, friendly service and deposit / withdrawal quickly. I usually directly invest in the real account without hesitation when finding according to my criteria. During my dabbling in forex there are some brokers who only take advantage without regard to survival. Not in my experience, some of my colleagues surveyed one of these brokers (MFX broker name). They enter a contest or investment in the real. And of some of the contest demo / rill found irregularities. There are some who win the tournament. They get rewarded according to the position and transact directly with the hope of developing investment. After a certain nominal withdrawal and does not fit the reality of their account has been deleted without confirmation. Therefore I do not recommend to colleagues who just wants to try the broker to invest directly. You can lose your money and time wasted. nominal is not much, but the question is this broker’s performance can be trusted or not? It’s up to you who judge. Finally, MFX Broker noticed my claim. even though my account was closed. Thanks to anyone who noticed my writing and thank you also for publishing my complaint here. To other colleagues who feel they have grievances about their emotions MFX broker, please do not hesitate to express her laments, hopefully there is someone who is kind enough to help. This broker says that they offer the cTrader platform but after applying for a live account and then being confirmed, they then tell me that cTrader is only offered as a demo account and is not offered on Live trading accounts. This to me does not make any sense as they use cTrader to market their brokerage and attract clients but in reality they do not offer this to their clients. I will never contact this broker by live chat again and certainly will not choose it for trading! I have a question regarding bonus program, at first they did not understand the question and then when I gave more explain, I got a nonsenses answer. Such a professional support team, stay away!